The discovery of two-ingredient dough was amazing. I am still amazed when I make this dough that it works and it is so versatile! I don't know who came up with this idea, but they are brilliant. So, what is two ingredient dough? It is a bread dough made from just two ingredients – self-rising flour and plain, non-fat Greek yogurt in equal parts (ie 1 cup of each mixed together). If you don't have self-rising flour, you can convert all-purpose flour by adding 1/2 tsp of salt and 1 1/2 tsp of baking powder to all-purpose flour. Since plain, non-fat Greek yogurt is zero points on Weight Watchers Freestyle, the only points in the dough are from the flour. ¼ cup of self-rising flour has 3 points. I have a recipe listing for two-ingredient dough in my app that I created to track the points based on ¼ cup. That means if I make it with a cup of flour and a cup of yogurt the result is 4 servings at 3 points each. Make sense? Mix the flour and the yogurt together. The dough is very sticky when mixed at a 1:1 ratio of flour to yogurt. To counteract this you can add flour to help roll it out but this increases the points in the dough. Therefore, I recommend either using less yogurt for the initial mixture or using a dough hook to mix it. I feel the results are best when using the dough hook on my KitchenAid mixer, it’s much less sticky when mixed this way. It also helps if you spray your hands with cooking spray before trying to shape the dough into anything. After it’s baked, you need to refrigerate the bread. It will grow mold in a day or two because it has yogurt in it (ask me how I know….). You can also freeze items to eat later. Now that you have the dough, what can you do with it? 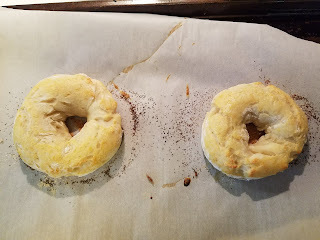 If you search for Weight Watchers two ingredient dough bagels you will find a bunch of tutorials on how to make these. I like this one from Slap Dash Mom, which gives you directions for making everything bagels. If you split the dough into 4 bagels, they will be 3pts each for the dough (+any toppings). Using the basic recipe will make 2 personal sized pizzas. 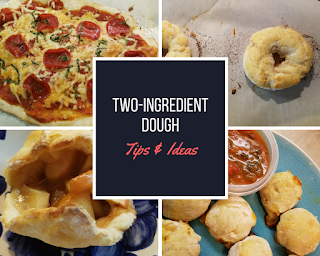 I split the full amount of dough in half to make pizzas for myself and my husband, if you only want to make 1 pizza, use 1/2 a cup of flour and 1/3 a cup of yogurt. This ratio will make your crust 6 points (2 servings of dough @3pts each). You can add a little garlic or dried basil to your dough when you mix it if you like. Before mixing your dough, preheat your oven to 400 degrees. Take the amount dough you want to use (see note above on serving sizes of dough and points), using as small amount of flour as possible (because it adds points) roll your dough out using a rolling pin on a sheet of parchment paper. You want the dough about 1/4 in thick. Transfer the parchment paper to a cookie sheet. Pre-bake the crust for 8-10 minutes, removing it before it turns brown. Top the pre-baked crust with a small amount of pizza sauce, toppings and cheese and return pizza to oven. Bake an additional 8-12 minutes until the edges of the crust are slightly brown. If you want a crispier crust, bake closer to 12 minutes. Personal sized pizza using two servings of dough for 6 points + toppings. The crust is 6 points plus whatever toppings you put on it. My pizza is usually around 10 points and very filling. 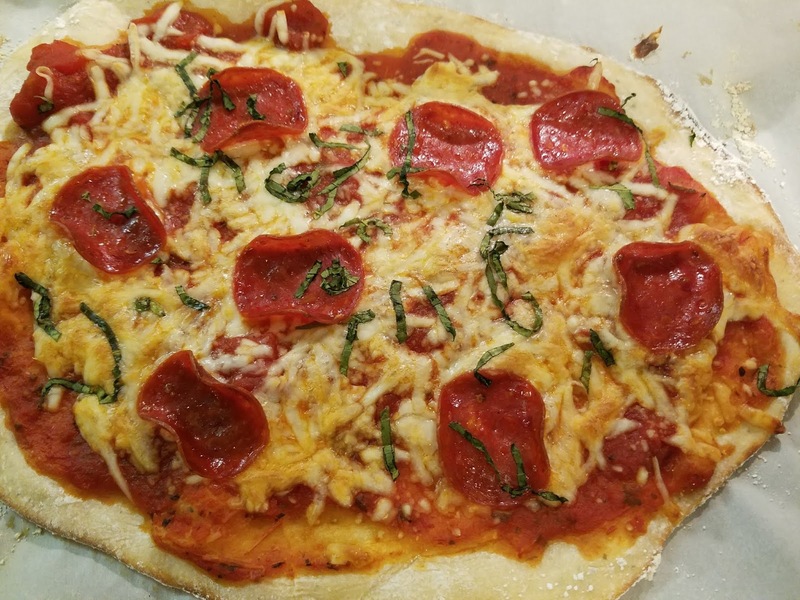 I like the Trader Joe's fat free pizza sauce, it's the lowest point sauce I have found at 1pt/serving (it's this one, I buy it locally at TJs). Another option that is low point for sauce is Classico Florentine and cheese marinara, it's 2pt/serving (it's this one, I buy it locally at Harris Teeter stores). Honestly, these are delicious but also kind of a pain to make. I recommend making only half a batch of dough for this, which makes about 9 pizza rolls. Preaheat your oven to 375 degrees. Take a small ball of dough, like the size of a large marble or slightly smaller than a ping-pong ball. Roll it out on a lightly floured surface into a circle. Put 1 slice of turkey pepperoni (I chop it up) and a small amount of cheese in the middle. Fold up the edges to seal the ingredients in the middle and form a ball (this is the hard part, especially if the dough is too sticky). Bake for 17-20 minutes, until dough is lightly browned. 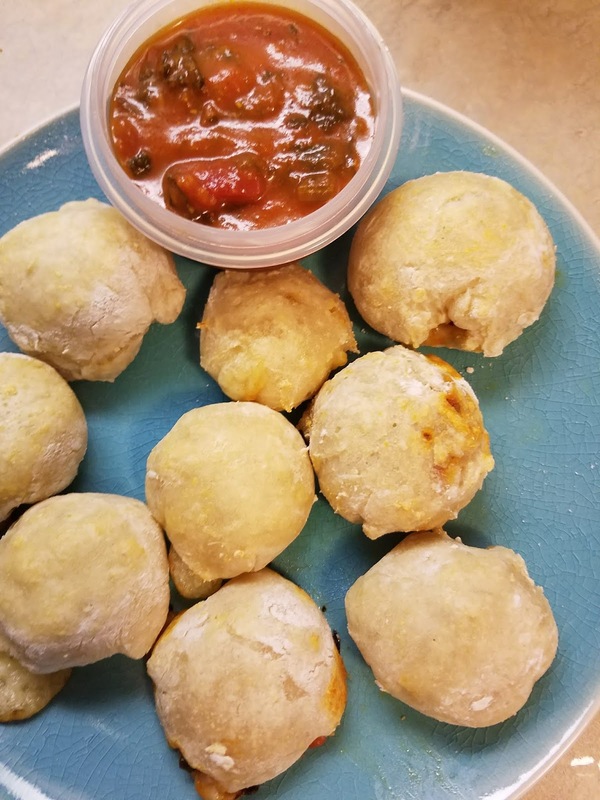 Repeat until you are out of dough, 2 servings of dough makes approximately 9 pizza rolls. Two servings of dough is 6pts + 1 turkey pepperoni + 2 for cheese + 1 for dipping sauce is 10 points. Preheat oven to 375. Divide the basic recipe into 5 equal portions. Roll each one out into a long tube, about half an inch thick and twist into a pretzel shape. Place it on a parchment lined cookie sheet. Repeat until all of the portions of dough are shaped. Coat the top of each pretzel with egg wash and sprinkle with salt. Bake for 17-20 minutes or until lightly brown. Based on 5 pretzels, each one is 2 points on WW Freestyle. 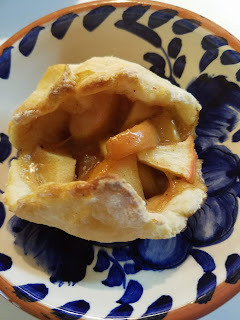 This recipe uses the 2-ingredient dough and a homemade low-sugar apple pie filling. They're 3 points each. You can even top them with a low-point ice cream for an a la mode treat! You can see the full directions here. Preheat oven to 375. Divide the basic recipe into 5 equal portions. Roll each one out into a long tube, about an inch thick. Repeat until all of the portions of dough are shaped. Coat the top of each breadstick with egg wash and sprinkle with a small amount of Parmesan. Bake for 17-20 minutes or until lightly brown. Based on 5 breadsticks, each one is 2 points on WW Freestyle. Powdered peanut butter taste test!